Our kitchen remodeling company brings you over 15 years of thoughtful, professional design build experience. Remodeling kitchens demand a distinctive approach, blending functionality and style to match the owner's specific needs. We understand that not all kitchens are made equal, and take a thoughtful, sophisticated approach to design and construction. When remodeling kitchens in Chicago’s North Shore, we take into consideration the bevy of designs to consider and tailor our guidance and recommendations to each client. With infinite layouts, thousands of appliances, and an array of finishes to choose from, working with a design-build company ensures a flawless execution of both design and construction in your North Shore home. 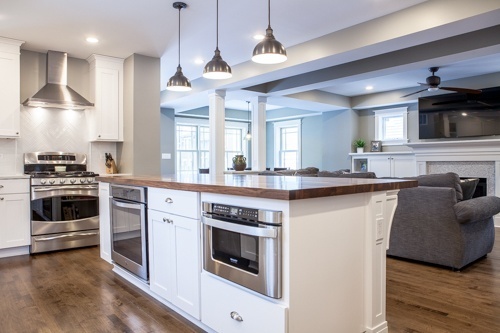 Kitchen remodeling in Chicago’s North Shore provides us with exciting opportunities to remodel outdated and inefficient kitchens into elegant, functional kitchens that are a joy to spend time in. With over 15 years of experience, we have worked with nearly every style of kitchen, in a variety of budgets. Our remarkable reputation demonstrates our unwavering commitment to creating elegant designs and executing high quality construction for our clients. When it comes time to remodel your kitchen, we strive for a high-level of communication every step of the way. Our design method is a step by step process that involves a seamless collaboration between our design team and our construction team. This process enables us to better meet our client's expectations because our team works together at every stage of the remodel from start to finish. We take great pride in our design experience and masterfully executed construction. We trust you will too. We invite you to take a look at our kitchen remodel projects and discover our meticulous design process at work.